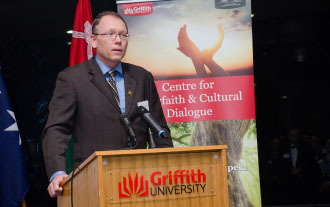 The first exhibition to be hosted in Australia opened on July 12, 2016, in Brisbane on the campus of Griffith University, at the Centre for Interfaith & Cultural Dialogue. 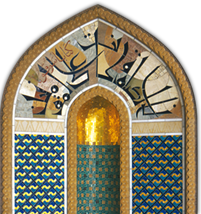 Visitors were greeted by the aroma of Omani frankincense wafting from terra cotta burners placed at the entrance. In attendance were approx 80-100 visitors, including students, faculty & staff of the university; several police commissioners; representatives of various faith communities; members of the Queensland Omani Society; plus representatives of the Department of Social Services; Middle East Connect; Access; Eid festival; Queensland African Community Council; the Consul of India; and others. Representing the Ministry of Awqaf and Religious Affairs, Mohammed Al Mamari expressed his gratitude to the university, and to the Omani Society of Queensland, whose members provided informational materials, brochures, pamphlets, flags, banners, books, etc. Approx 10 students dressed in dishdashas mingled and interacted with the crowd. The work of the Centre for Interfaith & Cultural Dialogue (ICD) is to foster respect for one another through deepening our understanding of one another. The more we understand one another’s religious, cultural and philosophical perspectives, values and traditions, the better our ability to work together to strengthen our communities and overcome the challenges facing the world.